Lori Cook-Folger began her genealogy research like most people, as a self-taught hobby. She began asking family members questions in 1984, received several pages of information from a great aunt soon after, and the excitement began. A photograph in her mother’s collection of a woman sparked curiosity. 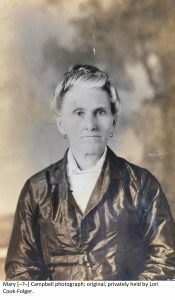 Her identity was unknown and she had written on the back “Remember me— tho my face you can not see.” Nearly twenty years would pass before a first cousin twice removed identified the woman as her grandmother. Lori loves to piece together the details that make up a person’s life. All of our ancestors left clues to their everyday life in the records and photos they created. 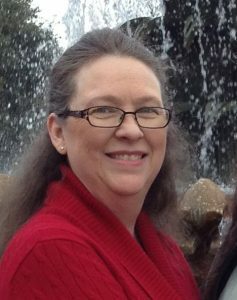 In 2011, Lori began her genealogical education to improve her skills and in 2015 earned the Certified Genealogist® credential. This credential is earned by submitting a portfolio of work to be evaluated by three independent judges. The portfolio is evaluated for documentation, research, writing, and the adherence to the Genealogical Proof Standard. Each year, Lori attends weeklong institutes on advanced methods as well as online courses to keep up-to-date with the industry. Her background is in Southern research and some Midwest research. She is the owner of Southern Genealogist, llc and researches unaccounted for WWII soldiers for the U.S. Army’s Past Conflict Repatriations Branch. More information here. The words Certified Genealogist and letters CG are registered certification marks of the Board for Certification of Genealogists®, used under license by authorized associates following peer-reviewed competency evaluations. Certificate No. 1064, expires 17 August 2020.